Lycopersicon esculentum Montserrat is what is commonly known as Tomaquet de Montserrat. Remember I am not a botanist though. I bought them as Montserrat tomatoes but this one in particular has a peculiar shape which makes me doubt. The point is that it is a juicy tomato and it cost me about 3 EUR. So as you can guess, it is great! Guess what, I got it for the picture. My wife has been two days waiting for me to shoot till finally today in the evening we made some tasty salad. They are really worth the money. For more clues, we bought them at Horta market although you can find them elsewhere in Catalonia. Delicious photo! If I were a tomato fan, I'd sneak it out of the picture! What a lovely ripe red and a perfect shape to slice in a sandwich. I like the tomato on the white background. You have a very patient wife! 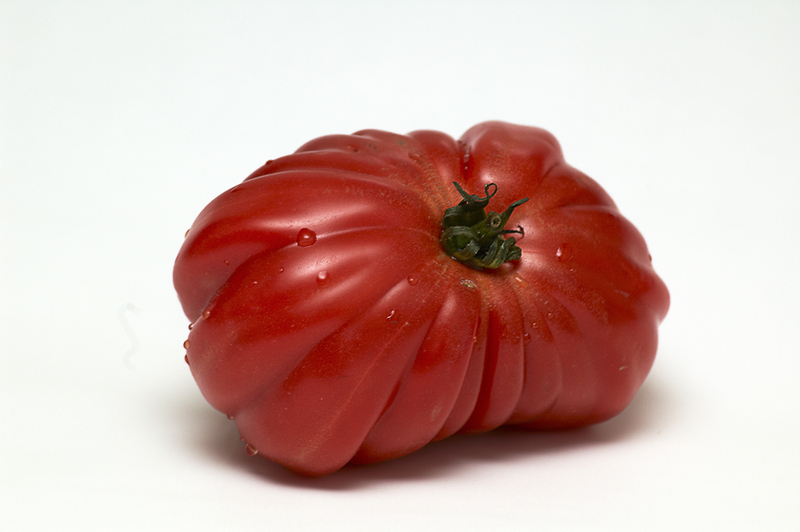 A very unusual shape but a perfect tomato red.